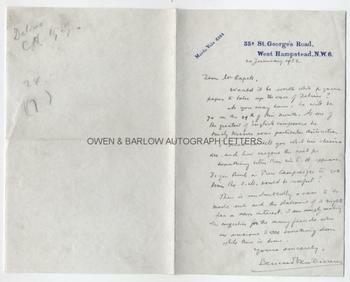 BERNARD VAN DIEREN Autograph Letter signed. Bernard Helene Joseph van Dieren. Dutch composer and noted musical writer and critic. ALS. 1p plus integral blank leaf. 35a St George's Road, West Hampstead, NW6. 10th January 1932. To the noted music critic Richard Capell. "Would it be worth while to your paper to take up the case of Delius? As you may know, he will be 70 on the 29th of this month. As one of the greatest of English composers he truly deserves some particular distinction. I need not tell you what his claims are, and how urgent the need for something better than his C.H. appears. Do you think a press campaign to get him the O.M. would be useful? There is undoubtedly a case to be made out and the statement of it might have a news interest. I am simply making the suggestion for the many friends who are anxious to see something done while there is time. 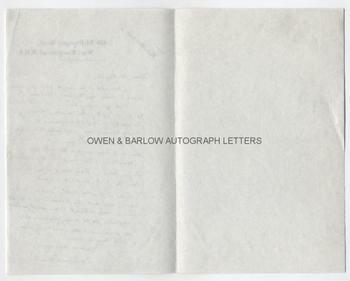 Yours sincerely, Bernard Van Dieren". 8vo bifolium. Approx 7 x 4.5 inches (18 x 11.5 cms). In fine condition. Recognition came to Frederick Delius late in life and he long remained relatively unknown to the public at large. Many of his works lay unpublished for many years. Some recognition eventually came with the composition of his quintessentially English works 'In a Summer Garden' (1908) and 'On Hearing the First Cuckoo in Spring' (1912). He was made a C.H. 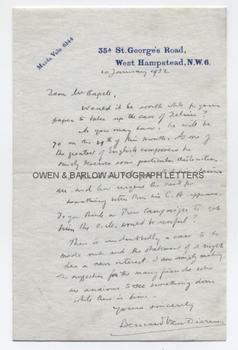 (Companion of Honour) in 1925 but the suggestion contained in this letter of Bernard Van Dieren that he should receive the O.M. (Order of Merit) never came to fruition. Bernard Van Dieren was something of a mysterious and enigmatic figure. He was largely self-taught but his compositions and playing were marked by a complex virtuosity. Many of his works have since been lost or are rarely performed. His wide circle of influential friends included Jacob Epstein, Augustus John and the Sitwells. During the First World War he spent time working as an espionage agent in Holland. He is believed to have been addicted to morphine resulting from bouts of ill-health. Following his death, there was a theory in circulation that Bernard Van Dieren had murdered his friend and benefactor, Peter Warlock (Philip Heseltine) in order to inherit under the terms of the latter's will.